What is Blockchain? How will it disrupt different industries? What should be done by technology leaders to adopt Blockchain, to stay relevant in the constantly shifting technological landscape? These are just some of the initial set of questions that are top of mind for anyone who has been exposed to one of technology’s latest buzzwords, Blockchain. The word “Block” refers to a group of transactions, and “Chain” refers to the linkage of the Blocks. 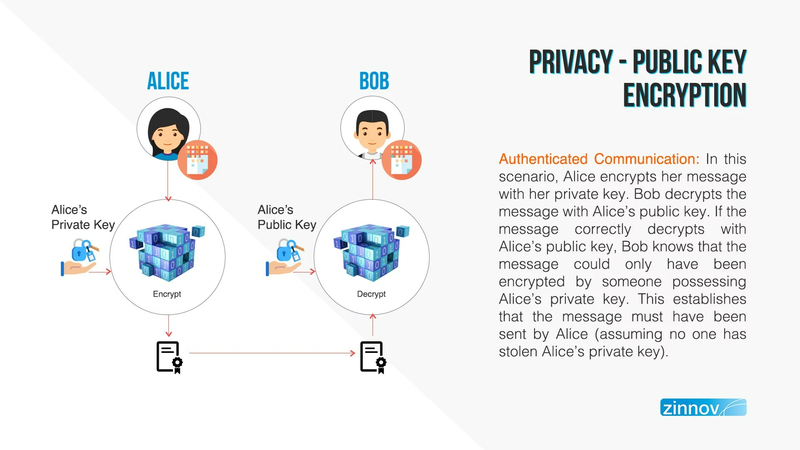 For example, when a transaction1 occurs, the transaction is secured using cryptography –which essentially is the signing in to a transaction with a private key of the owner that can be verified by anyone in the network using the public key. Multiple such transactions are grouped and stored together to form a Block. And miners (machines with computational power distributed over multiple systems) work to solve the cryptographic algorithm and generate a hash value (i.e. values returned by functions that map large arbitrary data sets with a data set that is of a fixed size) that will enable the linkage of a block to a chain of blocks. Consensus in the network is achieved due to mining, where the whole network creates huge computational power to generate a hash value using the cryptographic algorithm. In other words, the whole network spends genuine and cohesive effort to verify transactions. And as blocks get interlinked, it makes it virtually impossible to edit any transaction without changing each of the transactions leading up to it. 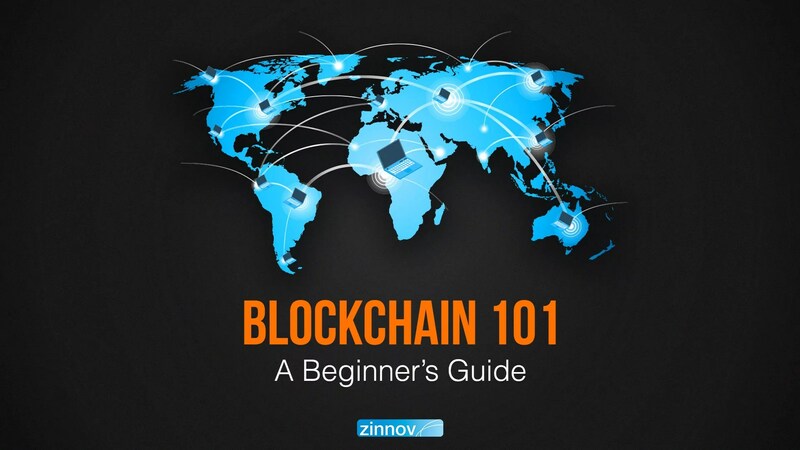 In essence, Blockchain is a cryptographically-secured, consensus-based distributed database. It can store any type of data such as financial transactions, contract information, or digital assets, in real-time. The most beneficial aspect of Blockchain is the associated transparency where current and historical data are made available for everyone (with the public key) to view. While Blockchain has technically been around since 2008, its full potential hasn’t yet been realized in terms of varied applications across industry verticals. Recent controversies surrounding cryptocurrency, and the investments in Blockchain have been held up, slowing down its adoption as executives have concerns about the technology. However, a lesser known fact is that Blockchain’s popularity has long surpassed that of Bitcoin’s, and the plethora of use cases that the technology offers will make it a must for organizations to bolster their business. The core value of Blockchain is that it removes the need for trusted intermediaries such as banks or the government in any transaction. Instead of having a centralized application logic, the peer-to-peer (P2P) network has its own proof of validity, authorization, and consensus mechanism. And by eliminating the intermediaries, the network reduces overhead costs involved in the exchange of assets, thereby reducing transaction fees drastically. In existing technology, high system availability is only achieved through a combination of expensive infrastructure and disaster recovery systems. On the other hand, Blockchain usually uses commoditized2 hardware, and since it’s a P2P network that runs on consensus, communication remains unaffected, even if a few nodes go down. In systems currently being leveraged, all digital documents can be duplicated easily. However, in the case of Blockchain, duplication is rendered impossible as it creates a unique digital file using cryptography to secure the documents. This brings in trust among the users as the protocol runs on secure cryptographic algorithms, which are also highly immutable. 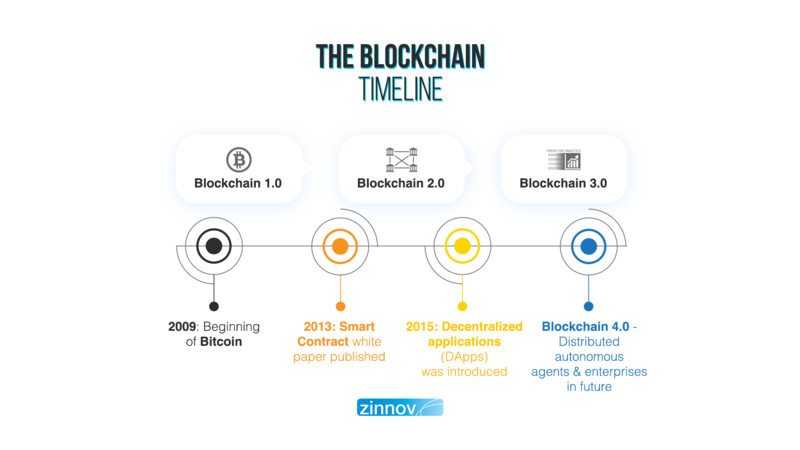 In 2009, Blockchain came into existence through Bitcoin. Bitcoin is a form of digital currency that is exchanged over a distributed network with encrypted digital signatures. While Bitcoin is digital currency used for various transactions, Smart Contract is the next, more evolved stage, where the terms and conditions for transactions can be programmed and stored in Blockchain, and actions can be automated based on triggers. Thus, a Smart Contract can be enabled between unknown parties to conduct business/trade without any third-party interference, even in the absence of conventional aspects of trust coming into play. Smart contracts gained momentum in 2013, when Ethereum, an open-source, Blockchain-based distributed computing platform came into being. One of the emerging ways of adopting Blockchain is through Decentralized Applications, or what is commonly known as “DApps”. These are like traditional applications where the front-end uses the same technology to render and process the information, the only difference being that it has smart contracts and distributed databases as the base layer. These DApps cryptographically store all data in Blockchain over a Consensus Protocol based on the rules approved by users. Compared to the current software solutions, DApps are more flexible, transparent, distributed, and have a more resilient structure. 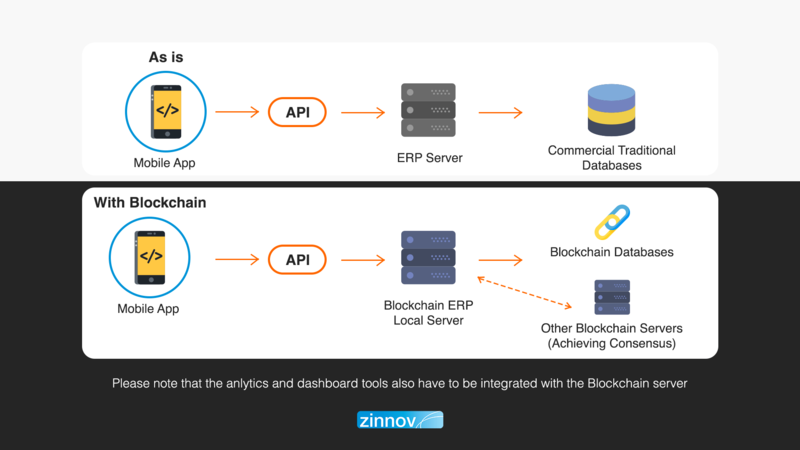 DApps have led to a more widespread adoption of Blockchain across various industries such as financial services, supply chain, utilities, etc. The primary benefit of Blockchain exists in sharing the information across trustless boundaries without the need of a central intermediary. As Blockchain provides a mutual consensus among parties with their own proof of validity and proof of authorization, the data that an organization controls as an important database and has certain people and processes to make sure that the data stays secure from tampering, can be moved to Blockchain easily. This type of data consumes a lot of time and money to manage and store. Blockchains (Cryptography + P2P distributed network) could easily replace the necessity of human intervention and expensive software from the picture, to keep it secure. Apart from solving the problem of confidentiality, robustness, and distributed security among multiple parties, Blockchain has a huge potential to unlock new opportunities. At very low cost, smart contracts have the power to change the way current products and markets work. Like with any other technological transformation, the first stage of experimentation will result in plugging the traditional application (old models) into DApps (new platform). This sort of a model may not necessarily work because Blockchain would traditionally require the change in the way applications work, giving rise to new decentralized business models. However, when interlinked with new age technologies like AI and IoT, Blockchain will improve capability to collect, communicate, analyze, resolve conflicts, and settle payments easily. As a result, completely new ecosystems will emerge with new enhanced solutions that can solve problems better and faster than anything that is available today. transaction1 – The word transaction could refer to any financial transaction, or any document or information that has to be secured using a Blockchain. commoditized2 hardware – Commoditized Hardware refers to hardware that is low cost and easier to replace, and something that is not expected to last longer. It usually runs on bare-metal OS, that has limited functionality and is very cheap. Such hardware doesn’t have an overhead cost due to the OS, and is available easily. 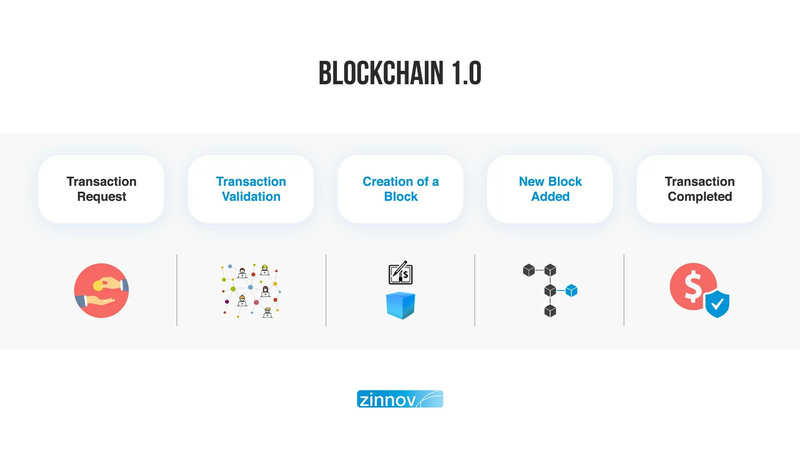 Share your thoughts and comments with us on this blog, and if you are interested in the new technologies disrupting the fundamental business models and processes of large MNC technology organizations today, contact us at info@zinnov.com.